To add a little more dimension to my layout (i.e. so my layout isn’t as flat as Holland) I thought about adding a tunnel. With the assistance of one of my classmates (he would obviously grow up to have a job in something electrical) I had made one of these in primary school with LED lighting at either end due to it being a single line only. It was pretty good if I do say so myself. However, I was hoping my modelling skills had advanced somewhat since that time. As with most of my layout, I started to do some research including internet, Hornby magazines and the like. I eventually came up with a concept of constructing the majority of the frame with timber then filling in the gaps and adding some contours with polystyrene. The new appliances meant that I had ample polystyrene to practice on and get it the way I wanted it. 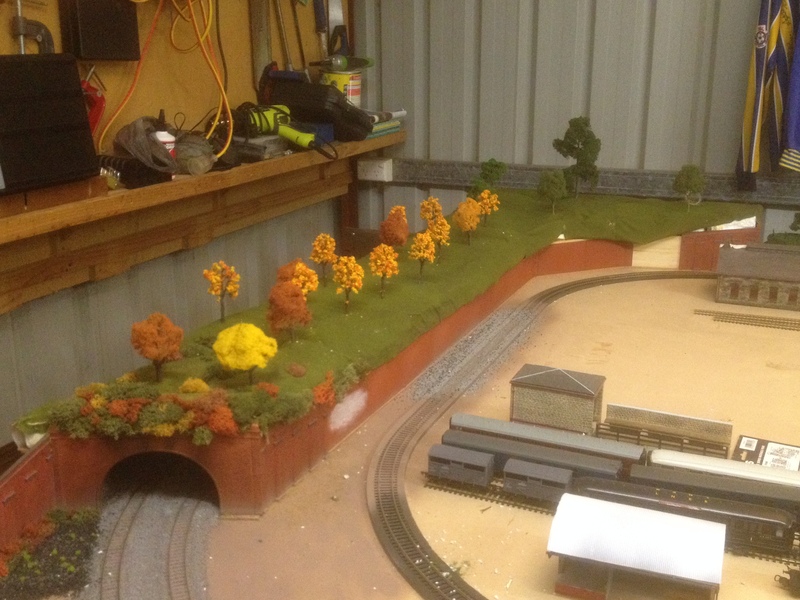 As you may be able to tell, the tunnel is sitting at the back / right hand side of the layout as you come into the shed. This is quite convenient as I have left enough space at track level (at the edge of the baseboard) to be able to access the tunnel itself. I have already found to date that trains still derail, or may faulter in the tunnel and without the easy access, I’d have to stick my arms down the mouth of the tunnel. Not a pretty sight, and certainly not practical. I used a couple of Hornby tunnel arches for the entrance and a handful of Wills plastic red brick walling. I tried my hand at trying to add some white mortar to one of the walls – pretty unsuccessfully and will be rectifying that one quite soon. That’s what happens when you rush in without the proper tools and skills to get it done. At least I didn’t try it on the rest of the walling. A roll of green grass together with a number of different manufacturer trees and bushes have round it off ok so far. I am yet to start adding more detail to this section of the layout at the moment as it appears to be my sons favourite location for “driving his cars around the wood”. Sometimes I think it almost best not to look and hope he appreciates just a bit of the work that has been involved in constructing his current play area. He seems to favour it more than the actual mini version of my layout that I constructed and placed beside this one. Happy to provide photos – it kept him quiet for a while and allowed me to work on my own. Suppose it was good while it lasted, although I am still hoping to tempt him away with a little more realistic scenary for Thomas Tank and his Friends. Has anyone got any experience with adding a little more detail, like foliage and grasses, onto the rolls of grass I have already laid? Lichen has been added in places, but obviously it doesn’t look too realistic just on it’s own. Back to the internet or Hornby magazines me thinks.